Jérome Rousseau and Nancy Bédard visit the Laurentians to talk ratios! On October 4, Jérôme Rousseau, FIQ Vice-President in charge of the ratio projects, and Nancy Bédard, FIQ President, travelled around the Laurentians region meeting with members in CHSLDs to provide an update on the ratio project at the Mont-Tremblant CHSLD. As they visited CHSLDs in the region, Nancy and Jérôme listened to the healthcare professionals’ concerns and problems. Another reason for their visit was to promote member participation in the project slated to begin at the end of October. 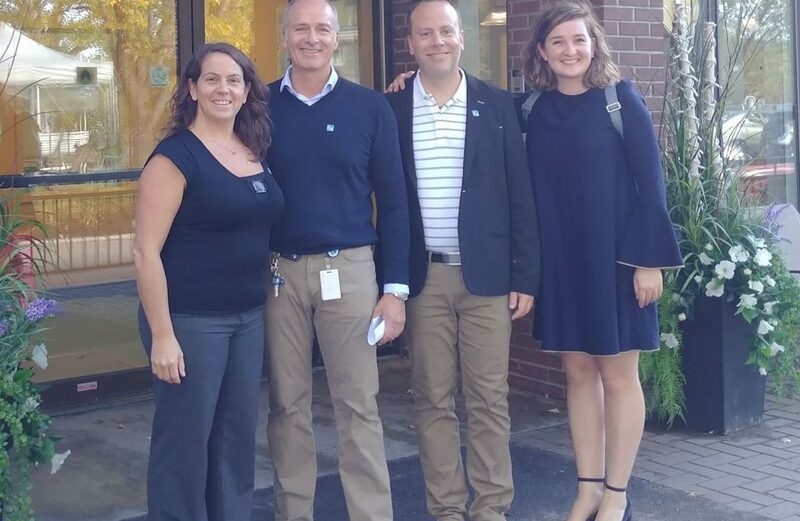 Julie Daignault, FIQ – SPSL President and Peter Delli Colli, FIQ – SPSL Vice-President in charge of the local ratio pilot project, accompanied them throughout the day, which culminated at the Pavillon PPL in Ste-Agathe des Monts with a celebratory event. The FIQ-SPSL Executive Committee would like to thank members for their warm welcome and participation.